Decadent chocolate pudding pie with peanut butter crust and a hint of coconut. 1. In a medium saucepan, whisk pudding mixes with 4 cups milk. 2. Stir in one or two egg yolks if desired. 3. Stir constantly on low heat until pudding thickens (10-15 minutes). 4. Transfer pudding into a bowl and chill for 2 hours. 5. Coat pie pan with coconut oil and set aside. 6. Combine graham cracker crumbs or almond meal with peanut butter and honey. 7. Add 1 tbsp of water at a time to graham cracker mix and knead with hands until it sticks together (4-6 tbsp). 8. Press graham cracker mix into pie pan, covering the bottom and sides in an even layer. 9. Chill crust for 2 hours. 10. Fill crust with pudding. 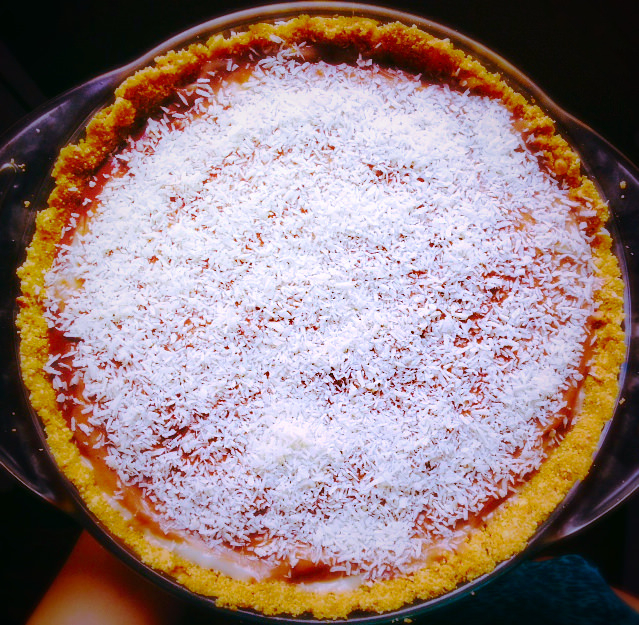 Sprinkle coconut on top and enjoy!